Pas verschenen | PTG Uitgevers b.v. When projects are complex and there is a lot at stake, there mostly is a kind of Project Board. Sometimes organizations call it a steering committee or a program committee. Managers with different expertise and different intentions are asked to keep the project or program on target. Is the Project Board effective? Sometimes. Is it easy to function as a joined team? No. For most people itis just another meeting in a long row. Do we need to abandon this monster? Certainly not. Just make the Project Board work. The Effective Project Board makes managers familiar with the nature, role and tasks of project boards. It enables managers to actively and consciously contribute to the success of projects in their organizations. It provides answers to questions such as: * Why do we have project boards? * What is expected from project board members before and during a project? * How can we establish managers' eligibility for project boards? * How do project boards relate to organizational governance? 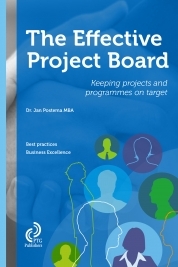 This book is aimed at managers who want to find out how they can fulfil their role as project board member. Project and program managers who want to learn how they can address the intricacies of project boards will also find it useful. Jan Postema (1954) studied Early Modern History in the Netherlands and holds an MBA from Hertfordshire University UK. He has been involved in project management for more than 25 years and acted as a project manager and project consultant in various organizations. Since 2013 he is a management team member in IPMA Netherlands' Dutch National Research Group in project management, which among other things aims at making the results of scientific research available for project management practitioners. The series Project House presents written and digital publications for Professional development in management. Providing a minimum of theory and a maximum of practical guidelines in a short notice. In addition, the books are ideal as a reference. When projects are large and a lot is at stake, there usually is some kind of project board. Sometimes organizations call this a steering committee or a program committee. Managers with different expertise and different intentions are asked to keep the project or program on course. Are such project boards effective? Sometimes. Is it easy for the members to function as a team? No. For most of them, a project board meeting is just another meeting in a long row. Do we then need to abandon this monster? Certainly not. We just need to make project boards work. The Effective Project Board familiarizes managers with the nature, role and tasks of project boards and their own role in them. The book enables managers to actively and consciously contribute to the success of projects in their organizations. It provides answers to questions such as: * Why do we have project boards? * What is expected from project board members before and during a project? * How can we determine managers' eligibility for project boards? * How do project boards relate to organizational governance? This book is intended for managers who want to find out how they can fulfil their role as project board member. Project managers and program managers who want to learn how to address the intricacies of project boards will also find it useful. Jan Postema (1954) studied Early Modern History in Groningen (The Netherlands) and holds an MBA from Hertfordshire University UK. He has been involved in project management for over 25 years and acted as a project manager and project consultant in various organizations. Since 2013, he is a management team member of IPMA Netherlands' Dutch National Research Group in project management, which aims at making the results of scientific research available for project management practitioners. The Project House series presents written and digital publications for professional development in management. Through a minimum of theory and a maximum of practical guidelines, you will gain a wealth of information and skills in a short notice. In addition, the books are ideal for reference. When projects are large and a lot is at stake, there usually is some kind of project board. Sometimes organizations call this a steering committee or a program committee. Managers with different expertise and different intentions are asked to keep the project or program on course. Are such project boards effective? Sometimes. Is it easy for the members to function as a team? No. For most of them, a project board meeting is just another meeting in a long row. Do we then need to abandon this monster? Certainly not. We just need to make project boards work. The Effective Project Board familiarizes managers with the nature, role and tasks of project boards and their own role in them. The book enables managers to actively and consciously contribute to the success of projects in their organizations. It provides answers to questions such as: • Why do we have project boards? • What is expected from project board members before and during a project? • How can we determine managers’ eligibility for project boards? • How do project boards relate to organizational governance? This book is intended for managers who want to find out how they can fulfil their role as project board member. Project managers and program managers who want to learn how to address the intricacies of project boards will also find it useful. Jan Postema (1954) studied Early Modern History in Groningen (The Netherlands) and holds an MBA from Hertfordshire University UK. He has been involved in project management for over 25 years and acted as a project manager and project consultant in various organizations. Since 2013, he is a management team member of IPMA Netherlands’ Dutch National Research Group in project management, which aims at making the results of scientific research available for project management practitioners. The Project House series presents written and digital publications for professional development in management. Through a minimum of theory and a maximum of practical guidelines, you will gain a wealth of information and skills in a short notice. In addition, the books are ideal for reference. Everybody plays the role of project sponsor at some point, for example during a renovation project at home. At work this role also crops up more and more frequently. As director, you commission the development of a product, or as manager you want to have a new IT system developed. You naturally expect certain results, and want to make favourable agreements with respect to schedule and budget. Often, however, this is not easy, which is logical enough, given that the role of project sponsor is new to many people. 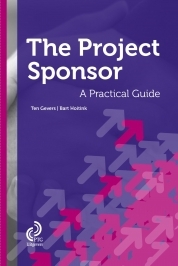 The Project Sponsor: A practical guide supports project sponsors by means of step-by-step plans, guidelines and practical tips to put directly into practice in order to really achieve results. It provides answers to questions such as: • Who is the best to fulfil the role of project sponsor? • What does a project sponsor do before, during and after a project? • How do you draw up a business case and how do you monitor it? • How do you keep track on the progress? • How can you best organise project sponsorship within an organisation? 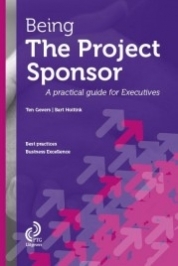 This book is aimed at sponsors of projects who want to find out how they can fulfil this role as well as possible, as well as others who are directly involved in projects, such as (project) managers and directors. Ten Gevers is director of Training and Consultancy NIMO in Soesterberg, and co-author of the popular books Practical Project Management 1 and 2. Bart Hoitink is director Business Development at NIMO Project Management Institute. The series Project House presents written and digital publications for professional development in management. Providing a minimum of theory and a maximum of practical guidelines, you will gain a wealth of information and skills in a short notice. In addition, the books are ideal as a reference. Everybody plays the role of Project Sponsor at some point, for example during a renovation project at home. At work this role also crops up more and more frequently. As director, you commission the development of a product, or as manager you want to have a new IT system developed. You naturally expect certain results, and want to make favourable agreements with respect to schedule and budget. Often, however, this is not easy, which is logical enough, given that the role of project executive is new to many people. Being the Project Sponsor: A practical guide supports executives who are engaged in projects by means of step-by-step plans, guidelines and practical tips to put directly into practice in order to really achieve results. It provides answers to questions such as: * Who is the best to fulfil the role of Project Sponsor? * What does a Project Sponsor do before, during and after a project? * How do you draw up a business case and how do you monitor it? * How do you keep track on the progress? * How can you best organise the project roles within an organisation? 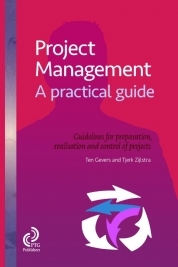 This book is aimed at executives of projects who want to find out how they can fulfil this role as well as possible, as well as others who are directly involved in projects, such as (project) managers and directors. Ten Gevers is director of Training and Consultancy firm NIMO in Soesterberg, and co-author of the popular books Practical Project Management 1 and 2. Bart Hoitink is director Business Development at NIMO ProjectManagement Institute. The series Best Practices in Business Excellence presents written and digital publications for professional development in senior management. Providing a minimum of theory and a maximum of practical guidelines, you will gain a wealth of information and skills in a short notice. In addition, the books are ideal as a reference. © 2019 PTG Uitgevers b.v.